Moorcroft Geranium vase - 6¼" (158 mm) high. In 1913, when James Macintyre Ltd, of Burslem, Staffordshire, closed their art pottery department in order to concentrate on the rapidly expanding electrical market, the manager and chief designer, William Moorcroft, had to find other employment. 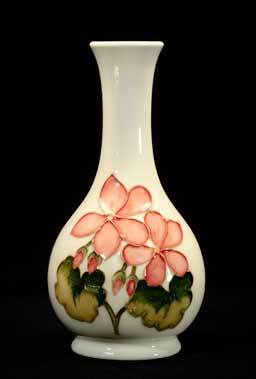 He opened W Moorcroft Limited so that he could continue where he left off at Macintyre's. His initial output, not surprisingly, was similar to what he had been doing at Macintyre's. Several of the production staff from Macintyre's art pottery department joined him in the new company. With production under his own complete control, he was able to produce finer quality pieces, choosing his clay more carefully. He experiment with and perfected flambé and lustre glazes, fired at high temperatures. The First World War put an end to decorative work, and utility wares were produced for the duration. A daughter, Beatrice, and a son, Walter, were born to William and his wife, Florence, in 1914 and 1917, respectively. Walter joined the company when he was twenty, and later took over the management when his father stepped down. The company was highly successful throughout the 1920s, receiving the Royal Warrant in 1928. In the 1930s, though, sales were not so good, possibly because Moorcroft refused to follow the art deco trend - a style he did not like. The Second World War saw a return the manufacture of plain goods for military and civilian use, and in 1945 William Moorcroft died. The company continued with Walter at the helm, and experienced mixed degrees of success in the post-war years. Much of the production was for the export market, and in the 1980s the company found it hard to compete, In 1986 it was sold, but Walter stayed for another year.